I’d said this posting would be a more detailed look at my colour palette for the Death Guard Plague Marine but that will have to wait until next time! It’s half written but I’ve been too preoccupied with figuring out the said colour palette to write about it! When I last posted I thought things were pretty much sorted, but my use of blue for the verdigris shook things up. This is pretty much the norm for me when I’m working with new, or unfamiliar, colour combinations; and it’s what makes trying new things out so interesting. I’m very happy with how the colours are working together now but I’ve really had to work hard at it! 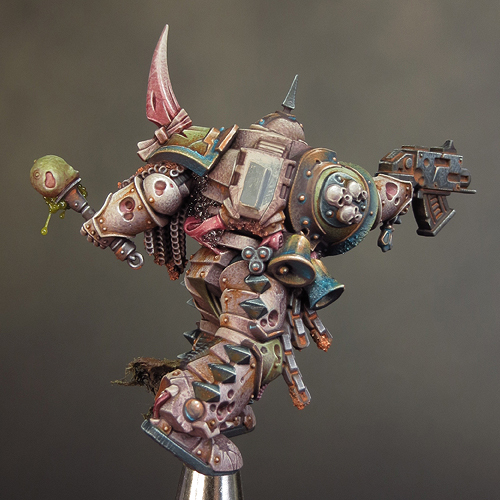 Almost every step of this paint job has presented some sort of challenge for me to resolve and, as a result, I’ve picked up a few new ideas for my Predator’s colour palette. 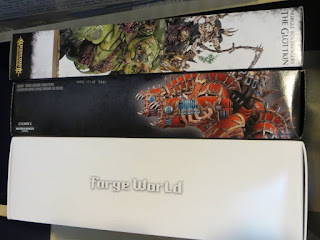 Who’d have thought that blue and orange would play a key role in a Nurgle themed colour palette! While my main focus was on sorting out the colours, I also gave a lot of attention to creating textures and material contrasts. This has been a worthwhile effort as it brings a lot of interest and a touch of realism to the paint job. I need to refine a few areas yet, but overall everything is coming together in a pleasing way. 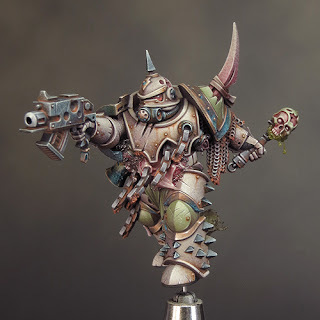 For the time being here are a few up-to-date work in progress pictures of my marine. It’s time to start work on one of my ‘exciting’ new projects because I think this one is going to take me quite a bit of time! I’ve already been thinking about this for a couple of years. At first it was simply an idea knocking around in the back of my head, something suggested by my friend Lee Hebblethwaite at the Golden Demon Winner’s day in 2014. But the idea took root and more recently I’ve been mulling over the practicalities. 2020 will see the 30th anniversary of my Nurgle Predator and my first Slayer Sword. It seems fitting to mark the occasion in some way and Lee's suggestion, that I create a new and updated version of the Predator, fits the bill. I’ve more than a few reservations about attempting this project as the Predator comes with a lot of history and emotional baggage. But it feels like the time is right and I’m confident I can bring something new to an updated version. So there you have it Project P30 has begun! In fact I’ve already featured this project here when I posted the picture above back in August. These kits will form the basis of my new Predator. I’ve decided that there will be more machine elements visible on the new Predator to better illustrate the fusion of demon and tank. 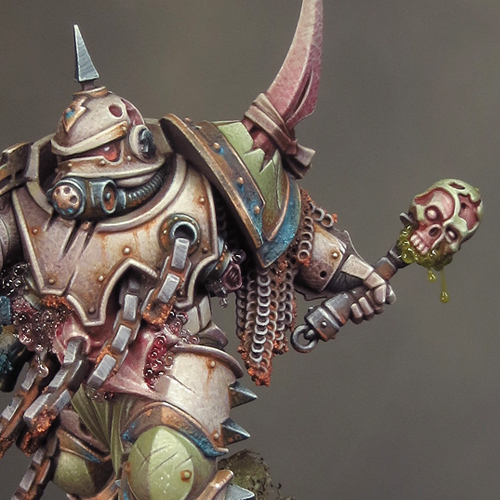 This will also give me a greater range of materials and textures to paint in contrast to the all over green flesh of my original. This means that I have to develop and expand upon the colour scheme so, in order to begin that process, I’ve started painting a Death Guard Chaos Space Marine. This will give me the opportunity to explore the colours I’ve been thinking about. It will also give me the chance to paint one of the new Death Guard miniatures, which have been tempting me with their shiny newness! I’ve decided to paint the majority of the armour in a bone colour. 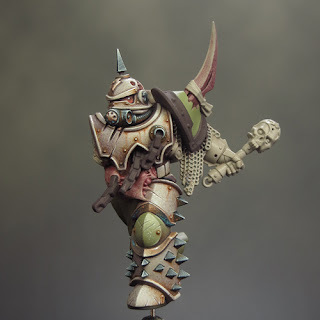 My usual approach to painting bone would be to work over a Rakarth Flesh base with a series of washes in a combination of brown and sepia tones. 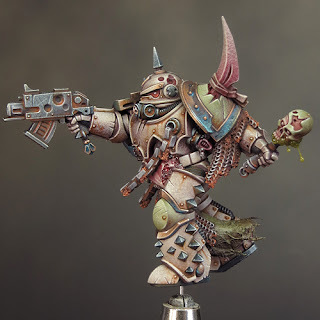 This is very effective but I felt it was the wrong approach for my Death Guard. 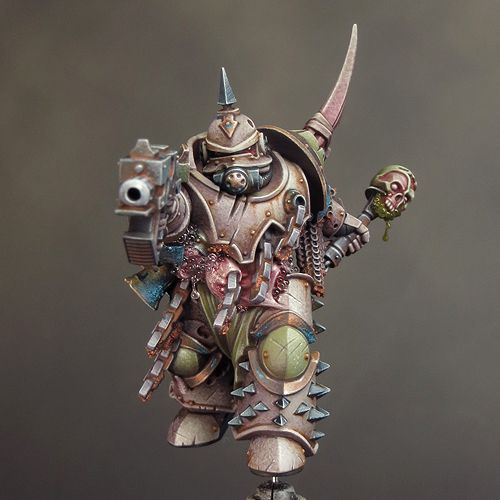 I wanted a colder, dirtier quality to the bone colour on the armour. To achieve this I’ve incorporated Black Leather from Scalecolour into my palette. This is the same colour that I used as a global shade colour on Gutrot Spume. It’s one of those strange, but useful, colours that isn’t quite one thing or the other. As best as I can describe it Black Leather is a dark, desaturated, purpleish brown. 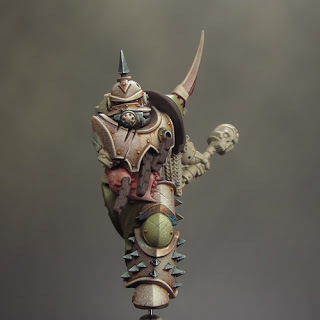 It mixes well with many other colours, both warm and cool, to make a shade tone and, in this instance, I’ve used it with Rakarth Flesh. The subtle purple tint it gives the shadows is exactly what I was looking for. It gives me a cooler bone colour than normal. But it's warm enough to keep the bone from looking too grey. This cooler purple tone will contrast with my rust effects and keep them distinct from the general layer of grime. 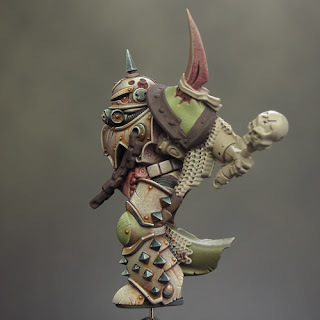 Against the bone I’ve used a cold dark green derived from, what else, Dark Sea Blue and a lighter warm green based on Death Guard Green. 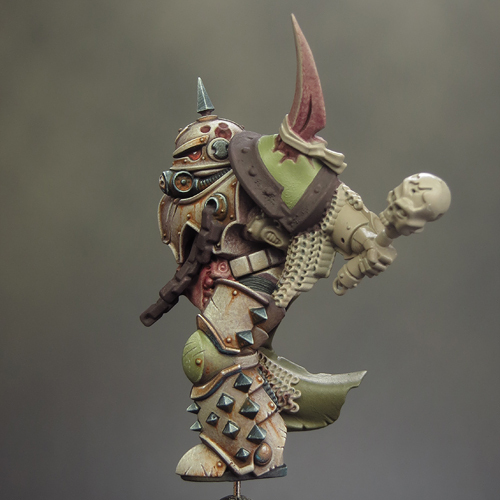 I will paint the metalics in NMM and for the majority of these I'll use a copper tone. Work on the Marine is progressing nicely, and I’ve just about resolved the colour palette, so I now have to forge ahead and apply it to the entire mini. Next time I’ll write about my overall colour palette for the Marine in greater detail and how it relates to the new Predator.